Givaudan captures the essence of the moment, bringing you memorable flavours and fragrances, to be enjoyed throughout the day. We are proud to be the industry leader, with 25% of the global market share in our industry. We maintain this position through challenging ourselves daily, inspiring our partnerships across the globe, and serving our customers with heart and soul. Together with our customers in the food, beverage, consumer goods and fragrance industries, we create products that delight consumers the world over. With a passion to understand consumer preferences and a relentless drive to innovate, we are at the forefront of creating scents and tastes that touch consumers’ emotions. Every single day we touch billions of lives, with taste and scent experiences that bring the senses to life. From prestige perfumes to laundry care, from your favourite drink to your daily meal, Givaudan is there, inviting you to engage your senses, every day, enjoying moments of delight. Today our operations cover the globe, with over 9,000 employees, working at over 80 sites. With an emphasis on bringing knowledge to our customers, we are always by your side, bringing insights and expertise to create scents and tastes that delight consumers’ ever-shifting desires. Our customers serve end consumer markets with flavours for beverages, savoury, snacks, sweet goods and dairy. In fragrances, our customers are in personal, home and laundry care brands, as well as prestige perfumes. In 2014, 52% of our Group sales were in Flavours and 48% in Fragrances. Scent colours your life; the smell of herbs in the kitchen, rain in the summer, festive treats, soft baby skin… In our world, the sense of smell is not the forgotten sense – on the contrary, we see the world through our noses. We think about smell all day, every day. The artistry of our perfumers encompasses a myriad of scented stories for brands everywhere. From prestige and designer perfumes, to the scent of functional cleaners, laundry and personal care products worldwide, our fragrances bring pleasure to millions daily. We live to perfume life. With a heritage that stretches back over 250 years, Givaudan has a long history of innovating scents and tastes. Creativity is at the heart of our operations, and the power to surprise is brought about by having the world’s greatest collection of expert, passionate perfumers and flavourists under one roof. We also invest significant amounts on research and development, enabling us to explore and uncover new and exciting ingredients and technologies to add to our vast palettes and portfolios. As a company that uses many natural ingredients, we operate a sustainable business model that creates value for the many stakeholders we work with, partnering in our efforts to help make a real difference. Discover our world, one that looks to enliven the planet with innovative flavours and fragrances, bringing joy in the moment as you engage your senses, savouring a flavour or re-living a memory in a beautiful scent. 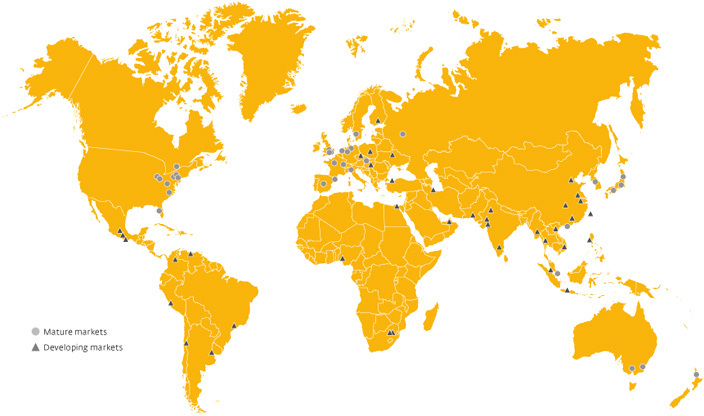 Givaudan operates in all regions of the world. We have over 80 locations worldwide, with more than 30 production sites, working in close partnership with our customers, locally, regionally and globally. Representing 54% of our annual sales, mature markets such as North America, Western Europe and Japan are expected to experience slower growth than developing markets yet still offer potential for growth in areas such as the increased demand for health and wellness products. Asia Pacific, Latin America and Eastern Europe, already account for 46% of our annual sales and this is expected to continue increasing year on year. Market growth is expected to be much higher due to urbanisation, changes in lifestyle and the increase in consumers’ disposable income. We have a dedicated presence with creation and production facilities in all key regions to fully capture this potential.